Agreements drive economic diversification in power, healthcare, oil and gas, mining and digital transformation of industry. Riyadh, Kingdom of Saudi Arabia. May 21, 2017: Building on its more than 80 years of partnership and experience in the Kingdom, GE [NYSE: GE] has taken significant steps in supporting the delivery of Saudi Vision 2030, today announcing in partnership with the Kingdom a range of Memorandums of Understanding [MoU] and projects valued at $15 billion – of which almost $7 billion are GE technology and solutions – across multiple sectors and partners aimed at creating a truly diverse and sustainable economic platform. Signed in the presence of the Custodian of the Two Holy Mosques, King Salman bin Abdulaziz Al Saud, and President of the United States of America, Donald Trump, the agreements cut across the power, healthcare, oil and gas, and mining sectors, providing tangible benefits to both nations. The initiatives touch upon the key pillars within Saudi Vision 2030, focusing on transforming the nation into a global investment leader and geographic hub and the upscaling of industrial skills and capabilities. The agreements also place significant emphasis on human capital development and the digital transformation across multiple sectors, with the expanded application of GE’s Predix platform, which utilizes cloud-based data analytics to better ensure and enhance manufacturing efficiency. Energy sustainability has been and remains a priority, and GE will be partnering with the Saudi Ministry of Energy, Industry and Mineral Resources [MEIM], Saudi Aramco, Dussur [formerly the Saudi Arabian Industrial Investments Company], and Ma’aden to significantly elevate power generation capabilities; provide a large-scale boost to the global industrial supply chain; and introduce massive productivity and efficiency savings through digital solutions in both the oil and gas and mining sectors. The collaboration between GE, MEIM and NICDP lays the ground for identifying a range of investments and joint ventures in various industrial sectors – including power generation, digitization technologies, oil and gas, mining, transport and aviation, and associated localization and supply chain development – and is expected to exceed $12 billion. Most notably, through this partnership these projects include efficiency improvements and additional generation of up to 12 GW of power, deployment of digitization technologies and the associated localization and supply chain development. Within the oil and gas sector, Aramco and GE have signed an MoU to undertake a digital transformation of Aramco’s operations with the goal of generating $4 billion in annual productivity improvements, as well as a broader Oil & Gas Investment Feasibility Study MoU. To enable the transformation, GE will provide a private Predix Industrial IoT cloud, GE’s pioneering APM and industry-specific applications, and staff a Digital Transformation Office (DTO) with local industrial engineers, process experts, and technologists. The DTO is expected to generate 250 high-tech Saudi jobs and stimulate local economic demand for an additional 500 Digital Industrial careers. To support the growth of a broader Predix economy, GE will work within Saudi Vision 2030 to create a STEM educational curriculum for high schools and universities to develop Saudi Digital Industrial talent to meet future demand for software developers and data scientists. The collaboration is a strong example of Saudi Aramco’s industry leadership and commitment to Saudi Vision 2030 to develop high-tech and knowledge worker careers that add significant value to the local economy. Saudi Aramco and GE have also partnered to implement a competitive, reliable and sustainable local supply chain. Dubbed the IKTVA Program, or the “In Kingdom Total Value Add,” the program aims to support Saudi Aramco’s 2021 Objectives of reaching 70 percent of its spend from within the Kingdom. GE previously won the ‘Best in Supplier Development’ honor at the IKTVA Excellence Awards program that marked the first anniversary of the launch of IKTVA in December. Among GE’s key initiatives that supported the goals of IKTVA in strengthening the Saudi supply chain are the opening of the second phase of GEMTEC in Dammam and the GE Oil and Gas Wellhead Manufacturing Center in Dammam. A memorandum of understanding will also examine the feasibility of new business development across the energy value chain, including enablers covering upstream, midstream and downstream oil and gas businesses, including development of Oilfield Services and Equipment (OFSE) manufacturing hubs. Focusing on the enhancement of local manufacturing capabilities at the GE Manufacturing and Technology Center [GEMTEC] in Dammam, the joint venture, historic in overall size and scale, will have a significant impact on both economies [Saudi and US], allowing for a major scaling up of the global industrial supply chain for the energy industry. The investment from Dussur in GEMTEC is a testament to GE’s commitment to advance and transform industry, beginning with the opening of phase 1 of GEMTEC in 2012 – the company’s largest heavy-duty gas turbine repair facility worldwide– and building on it through GEMTEC phase 2 in a bid to further support local, regional and global development. The mining sector in Saudi Arabia is a historic one – led by the Saudi Arabian Mining Company, Ma’aden – through its leading role in the mineral industry. GE’s partnership with Ma’aden will see the application of GE’s Digital Solutions, which will support the business in adapting to decreasing ore grades; reducing high energy and fuel costs; improving equipment reliability and availability; reducing maintenance costs and increasing overall productivity and efficiency. The transformation of the healthcare industry is a main priority of the government, which is looking to offer services and research capabilities on par with leading nations in healthcare around the world. 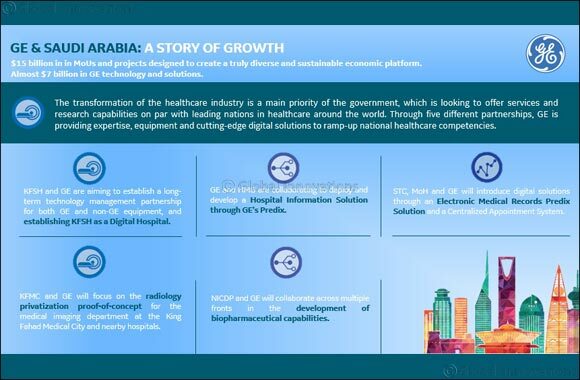 Through five different partnerships with King Faisal Specialist Hospital [KFSH], Dr. Sulaiman Al Habib Medical Group, the Saudi Telecom Company [STC], King Fahad Medical City [KFMC] and the Saudi Industrial Clusters Development Program [NICDP] respectively, GE is providing expertise, equipment and cutting-edge digital solutions to ramp-up national healthcare competencies. Through their partnership, KFSH and GE are aiming to establish a long-term technology management partnership for both GE and non-GE equipment, and in so doing establishing KFSH as a Digital Hospital, making use of advanced analytics, information technology systems and infrastructure. Education is a crucial component of this agreement, which will see the development of clinical, technical medical and leadership educational programs. GE and HMG are collaborating to deploy and develop a Hospital Information Solution through GE’s Predix, with the goal to deploy it in Saudi Arabia and across the region. The landmark agreement between STC and GE, under the patronage of the Saudi Ministry of Health [MoH], is a vital element in the digitization of industry in the Kingdom. The three partners will introduce digital solutions through an Electronic Medical Records Predix Solution and a Centralized Appointment System [CAS], which together will serve to transform the centers into ‘digital hospitals.’ These solutions will touch primary care facilities and hospitals across the region. The partnership between KFMC and GE Healthcare focuses on the radiology privatization proof-of-concept for the medical imaging department at the King Fahad Medical City and nearby hospitals, in addition to providing an operator to validate the government-wide operations over a 10-year period. This cooperation agreement will foster collaboration across multiple fronts in the development of biopharmaceutical capabilities in the Kingdom, stressing on the importance of vaccine research and the development of local capabilities, eventually leading to the initiation of a bio-science park. The sustainability of the multiple partnerships hinges on a critical component – an active and engaged workforce delivering on the limitless potential evident. The MoU with the Small and Media Enterprises Authority [SMEA] in Saudi serves to highlight the entrenched commitment to capability enhancement in GE’s business in the Kingdom. Through the training and development of thousands of Saudi nationals, and the offering of thousands more job opportunities, the agreements are a crucial element of the long-term sustainability of local industry. With a presence of more than 80 years, three offices and seven facilities, Saudi Arabia accounts for the largest GE workforce in the Middle East, with over 2,000 employees driving the Aviation, Healthcare, Oil & Gas, Power and Digital businesses.